The Liverpool midfielder unexpectedly conjured a magnificent penalty during the shootout loss to Manchester City. NOT MANY OF us were expecting Emre Can to step up during yesterday’s Capital One Cup final shootout with Manchester City and deliver such a composed, clever and risky finish. The midfielder was the only Liverpool player to score from the spot, with Willy Caballero subsequently saving efforts from Lucas, Philippe Coutinho and Adam Lallana. But Can kept his nerve, despite conjuring an infamous ‘panenka’ and chipping his kick down the middle of the goal. Despite having accomplished something that three of his team-mates failed to do, there was a feeling among some Liverpool supporters that the way in which Can humiliated Caballero motivated the goalkeeper to go on and make the crucial saves that he did. There is another, more likely, explanation, of course. That the standard of the other Liverpool penalties was just too poor. 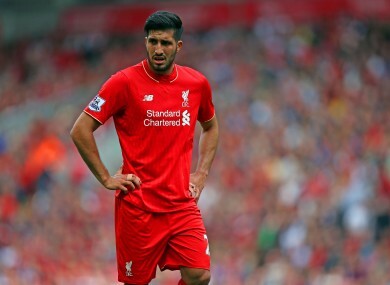 Email “Some Liverpool fans think Emre Can's cheeky penalty caused them to lose yesterday ”. Feedback on “Some Liverpool fans think Emre Can's cheeky penalty caused them to lose yesterday ”.